A cyclonic circulation is forming south southesast of Acapulco by about 100 miles. It has a large area of tropical moisture to draw from and winds aloft look favorable for development. A tropical depression is likely to form in the next 12-24 hours if this trend continues. 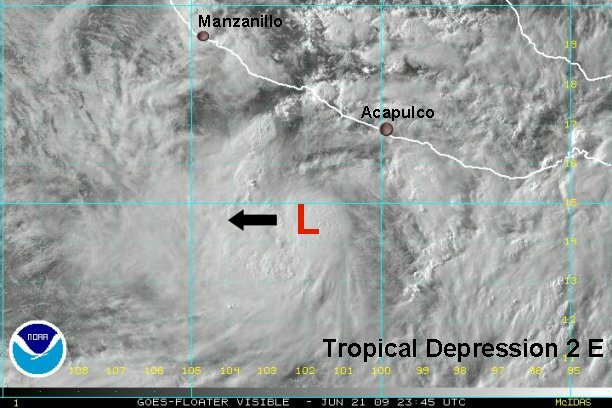 A tropical depression is forming about 160 miles south of Acapulco. The disturbance has drifted west north west overnight. Locally heavy rain is possible on the coast, especially over the mountainous regions. 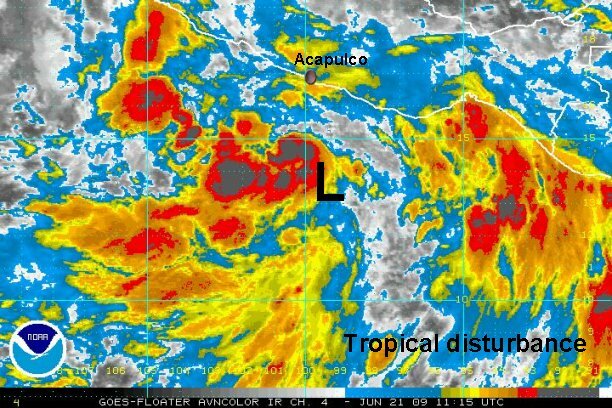 There is an excellent chance that this will be upgraded to tropical depression 2 E today. I.R. satellite imagery shows a very large area of unsettled weather with deep convection especially from 100° - 103° west and 13° - 15° north. It appears that any surface low is displaced east of the deepest convection. 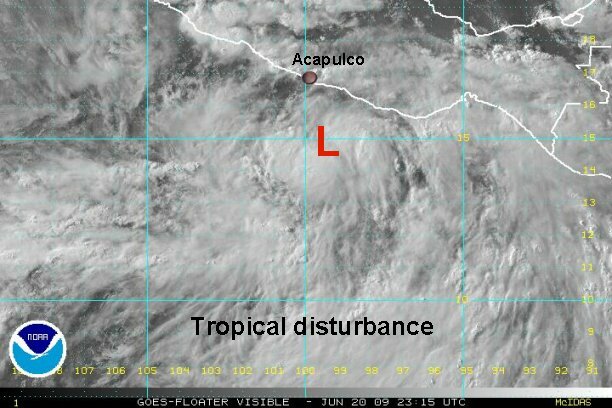 It is our estimation that a tropical depression has formed about 185 miles southwest of Acapulco. It is moving west northwest away from Mexico. At this rate it could become a tropical storm within 12-24 hours. NHC has finally classified this system. It will likely be upgraded to tropical storm andres overnight. 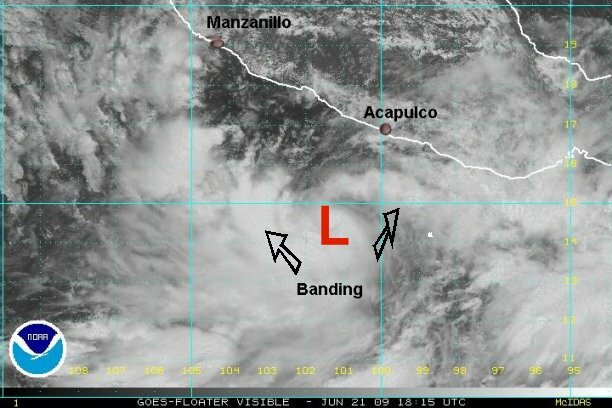 As of 9 pm edt (6pm pdt) the center of circulation is near 14.5° N / 102.0° W or about 215 miles (185 nm) southwest of Acapulco - or 360 miles (315 nm) southeast of Manzanillo, Mexico. Tropical depression 2 e is moving west at 9 mph. In our estimation, top sustained winds are probably near 35-40 mph. It is quite possible that this system will be named Andres in the next update from NHC. Forecast models insist that this system will start moving more northward in the next 1-2 days. Interests on the west coast of Mexico north of Acapulco northward to Puerto Vallarta should keep up with the latest updates. A cdo (central dense overcast is starting to form near the circulation center. Banding is still evident. Very heavy rain is occurring, but mostly well offshore. As of 7 am edt (4 am pdt) tropical storm Andres was centered near 14.5 N / 103.0 W.....based on I.R. satellite images. This is a perilous way to estimate and admittedly very tough to get a good position based on this, especially on today's imagery. We'll know more with the visible imagery in a few hours. Top sustained winds are officially 50 mph based of Dvorak estimates and an earlier 50 kt Quickscat pass. Since the earlier advisory, cloud tops have warmed and the Quickscat has lower estimates. We'll estimate a little lower at 45 mph at this time. Direction of motion is officially west northwest at 3 mph, but again the estimate is based on I.R. satellite interpretation and model forecasts. This looks good, but our initial position is a little farher south. Forecast models continue to insist on a more northward track taking Andres close to the coast south of Cabo Corrientes in 1-2 days. The main threat looks to be rainfall, but there is a chance that Andres could reach hurricane strength. A very impressive burst of convection occured somewhere near the circulation center over the past several hours. Clouds tops are warming (a little) again. It is tough to tell if the surface low is colocated with the mid level which is near the deep convection burst. This is crucial to know, the system will develop more slowly if the low is tilted. Visible satellite should give that answer soon. At 1:30 pm edt the center of ciculation of tropical storm Andres was near 15.6 N / 102. 6 W or about 150 miles south southwest of Zihuatanejo, Mexico. It is moving north northwest at about 5 mph. NHC's earlier advisory had winds at 50 mph. We now think the winds have increased to 55 mph and are still on the rise. The current motion will put Andres very close to the coast by early Tuesday. keep in mind that the effects of wind and rain will arrive ahead of the low center, even if it does not make landfall. Finish preparations soon in the watch and warning zones. Heavy rain may cause flash flooding, especially in mountainous regions. A very strong bursting phase is currently going on with deep convection and very cold cloud tops over the center of circulation. This is indicative of a strengthening phase. At 7:30 pm edt (4:30 pdt) tropical storm Andres is centered near 16.5 N / 102.4 W moving north northwest at about 7 mph. NHC has wind estimates at 60 mph. That looks close to us, although the winds may be slightly stronger. A recent satellite estimate was at 65 knots. Forecast models have been doing well so far and take Andres close to the coast of Mexico, north of Zihuatanejo by tomorrow morning. The models develop Andres into a minimal hurricane late tonight or early tomorrow, then slowly weaken it as it curves northwest, a little south of Cabo. Heavy rain may cause flash flooding, especially in mountainous regions. Forecast models predict 6"+ for the coastal mountains where Andres approaches the coast. 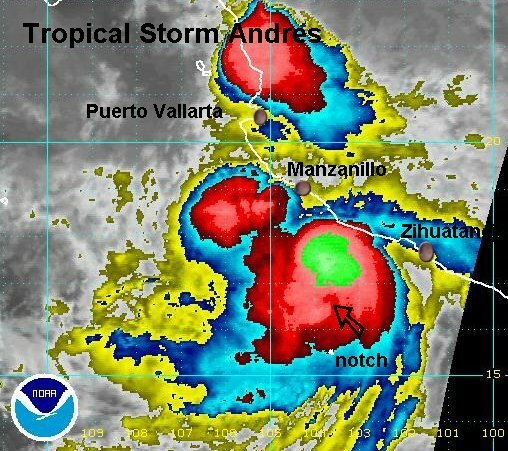 At 7 am edt (4 am pdt) tropical strom Andres was centered near 16.8° N /103.7° W or about 170 sse of Manzanillo, Mexico. We believe that NHC's estimate from the earlier advisory is off a bit. A notch in the cloud pattern has appeared on the Funktop imagery, indicative of an eye forming. Their estimate was likely taken off of the I.R. - a much more difficult estimate. We believe that top sustained winds are very close to hurricane force...NHC's estimate of 70 mph looks good and it will likely go up to 75 mph on the next advisory. We expect andres to be named a hurricane soon. Thankfully Andres is moving northwest - at about 8 mph, with the strongest winds and heaviest rains staying barely offshore. This is sparing the coast of the worst weather conditions. Forecast models continue with the trend of recurving Andres south of Cabo San Lucas. With the cooler water temperatutes, Andres should have weakened some by that point. Interests in the southern Baja should follow the latest on Andres carefully. 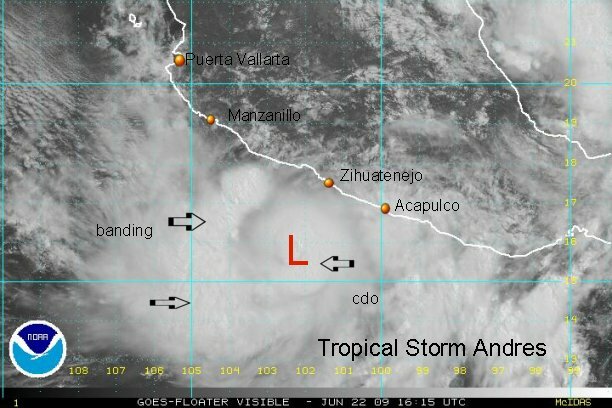 At 7 pm edt (4 pm pdt) Andres was centered near 18.8° N / 105. 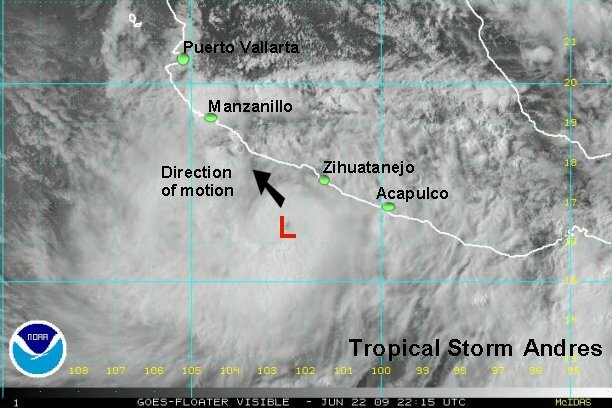 4° W or about 70 miles west southwest of Manzanillo, Mexico. It is moving northwest at about 13 mph - away from the coast. Top sustained winds are now officially 75 mph. A recon report had a sea wind estimate of 67 knots and a measured flight level wind of 62 knots. The satellite presentation is not nearly as impressive as before. We estimate that the top sustained winds were near 75 mph several hours ago, but closer to 65 mph now. Easterly wind shear exposed most of the low level center recently indicating a sick system. Some of the thunderstorms have built back around the center at this time. The forecast still shows Andres moving south of Cabo. Weakening is likely as it passes by, so that the main threat would be some rain bands in the next 24-36 hours. 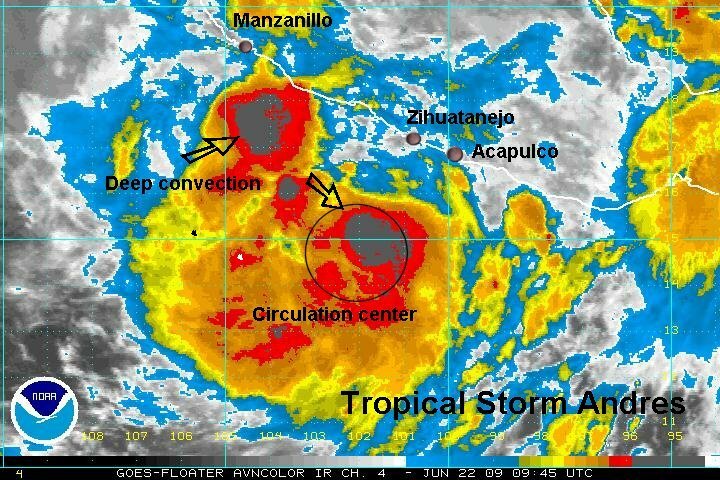 At 7 am edt (4 am pdt) Andres was centered near 19.7° N / 107.5° W or about 265 miles southeast of Cabo San Lucas, Mexico. It is moving west northwest at about 12 mph - away from the coast. It appears to be speeding up from NHC's estimate of 9 mph in the earlier advisory. Remember positioning overnight is very difficult with I.R. satellite imagery. Officially as of the last advisory, Andres was estimated at 60 mph. That was during the waning effects of a burst. The satellite presentation looks very poor and it is deteriorating rapidly. We estimate that top sustained winds are 50, maybe 45 mph at this time. 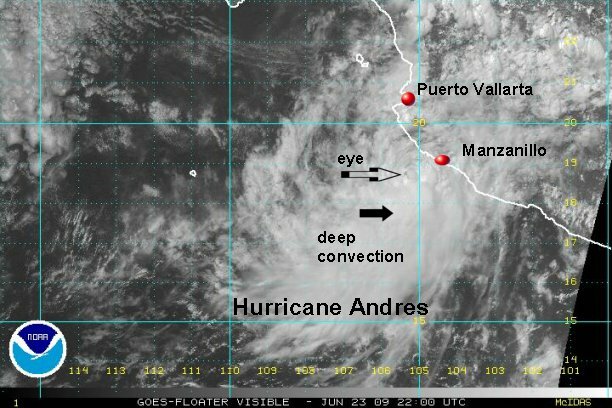 Look for Andres to continue this weakening trend as it passes south of Cabo. 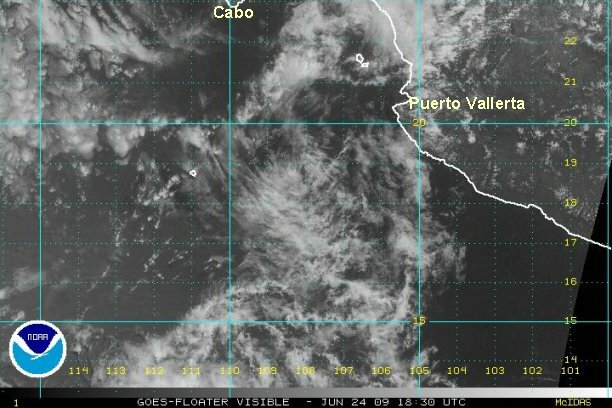 The only effect experienced on the southern Baja with be some higher than normal waves and rain showers. 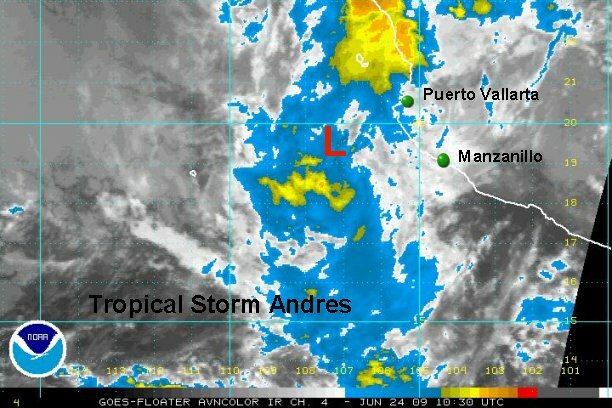 Interests in the southern Baja should follow the latest on Andres. In a dramatic way, Andres went from being a hurricane (officially) to a tropical nothing in about 18 hours. We think that it actually was a hurricane briefly yesterday late morning, not late afternoon per the NHC advisory. Even this morning, official wind speeds looked to be too generous. Look at the satellite imagery over the past several posts to fully view the dramatic change of events.